UPDATE: The JSU Tiger Fund will host a community reception for Coach Brent at 6 p.m. Wednesday, March 27, at the Penguin, 1100 John R. Lynch St. in Jackson. 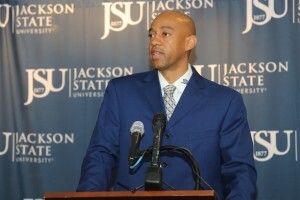 Wayne Brent – a championship winning coach – was introduced Monday as the new head men’s basketball coach for Jackson State University. After welcoming Brent to JSU, Director of Athletics Dr. Vivian L. Fuller presented him with a jacket and shirt bearing the university’s logo. Brent thanked God, his family and the university administration before laying out his plans for JSU. “There are certain goals that I have set for this program. I want to give guys a chance to dream,” Brent said during Monday’s news conference, adding that he’d like the team to reach the NCAA Tournament in the next few years. Brent, who is one of the most successful basketball coaches in the history of the Jackson Public School system, brings more than 15 years of coaching experience at the high school and collegiate levels to JSU. He comes to Jackson State after leading Jackson’s Callaway High School to the 2013 state championship. Brent succeeds Tevester Anderson, who retired last week. Anderson was 149-170 in 10 years at JSU. Brent had a highly successful tenure at the helm of the Callaway Chargers program. From 2007-2008 through 2012-2013, his teams have won five division championships and four state championships. Prior to taking the Callaway job, Brent was the head coach at Piney Woods High School. In three years at Piney Woods, Brent led the Tornadoes to a 72-16 record. In 2004, his first year at the school, the Tornadoes finished with a 31-6 record and earned a divisional title. Over the next two years, his teams went 20-6 (2005) and 21-4 (2006) with two additional divisional titles. From 1998-1999 through 2000-2001, he served as an assistant men’s basketball coach at the University of Mississippi. While at Ole Miss, the Rebels made three NCAA tournament appearances and a post-season NIT appearance. Ole Miss finished with a 27-8 record, won the Southeastern Conference Western Division title, won the SEC Tournament and advanced to the Sweet Sixteen in the NCAA Tournament. Prior to serving as an assistant at Ole Miss, he was the head coach at Provine High School in Jackson. Brent was joined at the news conference by his family. He talked about the long path that led to his new position, including all the people who crossed his path over the years. He said he wants his new JSU players to know he wants a team with a passion to play basketball, but to also possess the traits of humility and perseverance. He said he will direct them to stay in class and be good citizens. “I believe in staying up late and I believe in getting up early in the morning,” Brent said. After listening to Brent, JSU President Carolyn W. Meyers said she was impressed by him and directed the students in the audience to take notes. Meyers also thanked Anderson for his work during his tenure. She said she could see the imprint he’d left on the student-athletes when she talked to them. “What impresses me is that what we have here are good athletes, good scholars and good gentlemen,” she said.